Description: A freshly painted D9-40CW heads Westbound with the 11K at Milepost 241.0 on the NS Pittsburgh Line. Description: Ex Conrail NS 6723 is pushing its train back in the Yard; NS 9890 leading the middle has a crew on board and is ready to go; NS 8604 (leading the train ont he left) one of the rare surviving C39-8 is waiting for a crew. Description: Pushing trailers upslope. This train also has four locomotives on the front end. Description: 5 C40-9W locomotives sit on the outskirts of Allentown Yard awaiting their next assignments. Description: Two locomotivs are mid lashup with 9 others sitting in Bethlehem Pa. 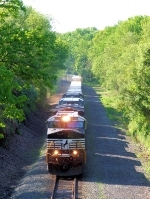 Description: Westbound autoracks rounding the curve east of Newport. Description: NS 11J west along the Lehigh River at steel City @ 09:36 hrs. Description: As did most trains today. Of course this is the only siding between Porter and CP Gibson. 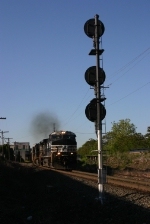 Description: NS-153 meets NS-118 under the signal bridge in downtown Cornelia, GA . Description: Having met NS-118 under the signal bridge in downtown Cornelia, 153 continues Southward on Track-1. Description: NS-153 Southward bound on Track-1. Next stop: Chamblee, GA . Description: Higginsville Road, Readington Township, 0909 hours. Description: A late 212 comes east after waiting for 11J and 21M. Description: 17th Ave., 1006 hours. Description: Horsehead dash 9 leads NS autorack/intermodal 212 eastbound by the signals and former passenger station at CP Phillipsburg on the Lehigh Line. Description: NS 25Z rockets over the Cuyahoga River and Ravenna Rd as it charges towards Chicago with loads of UPS shipments.